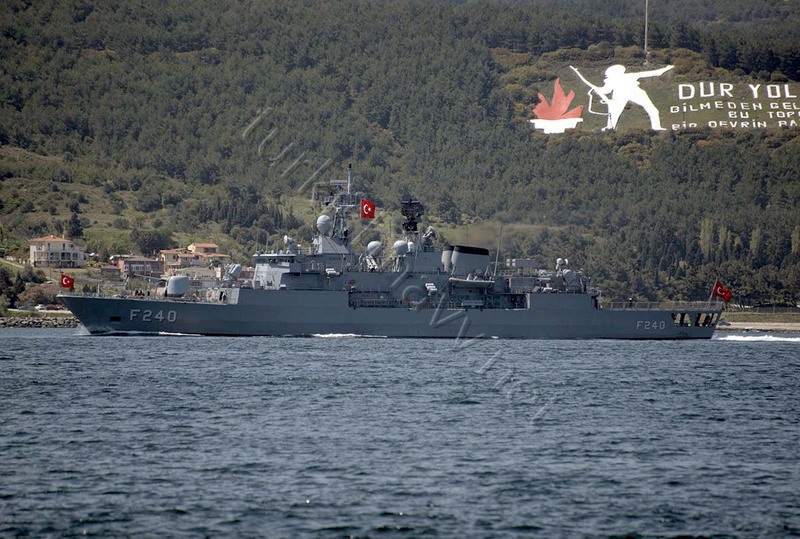 This was brought to my attention by my fellow ship spotter Mr. Alper Böler. 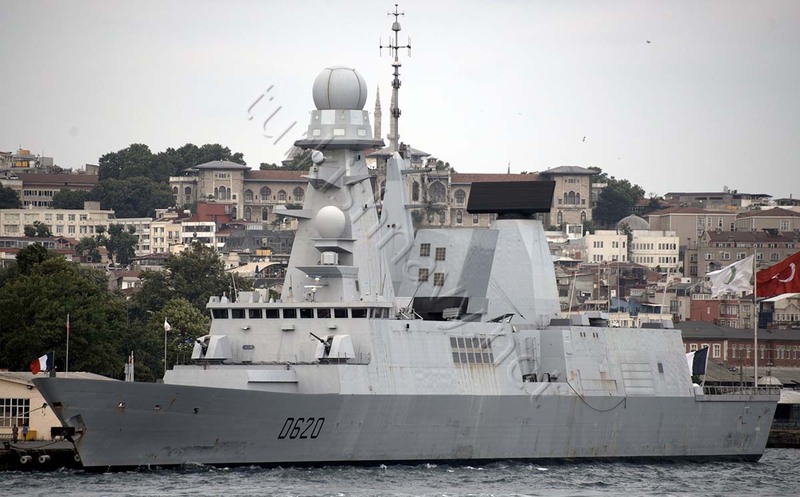 He was looking for the ships taking part in Sea Shield exercise off the coast of Romania he noticed that the French F-70 class destroyer D-643 FS Jean de Vienne was sending her AIS signals from the Black Sea. This was odd as her passage through the Turkish Straits was totally unobserved which is not impossible but highly improbable. 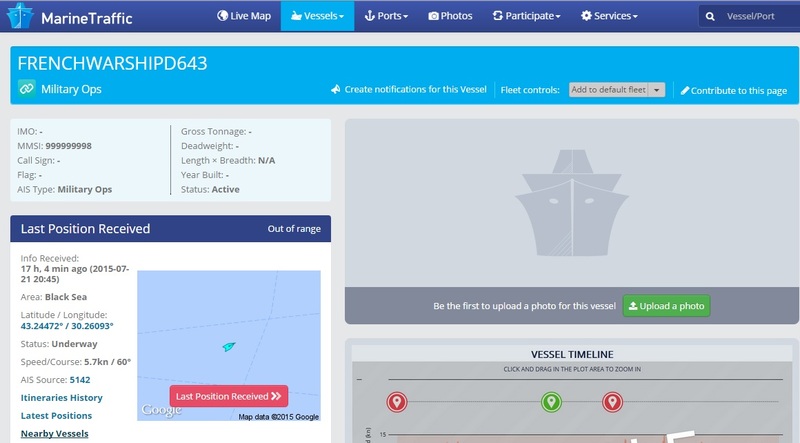 The ship tracking site Marine Traffic noted her last position to be in the Black Sea 43,24472° N and 30,26093° E.on 21 July 2015. But when looked to her older position recording one day ago she was in Tyrrhenian Sea at 41,41823°N and 9,4666° on 20 July 2015. The distance between these two coordinates is about 1300 nautical miles depending on the course taken. 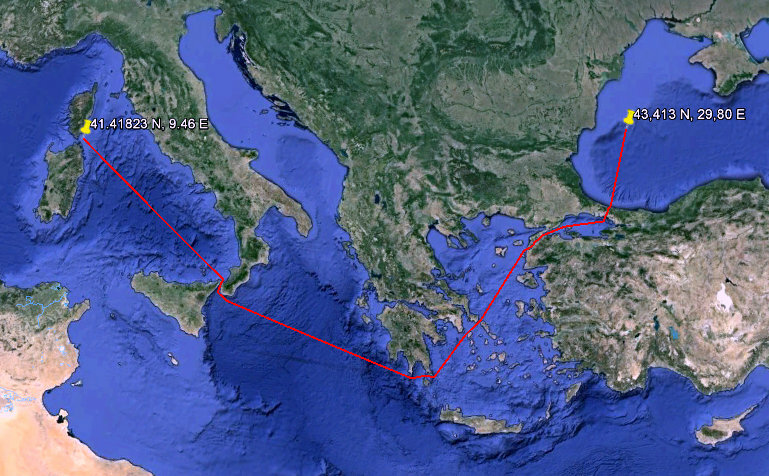 If she really made that trip in the given time frame she must have sailed at least with a speed of 54 knots. 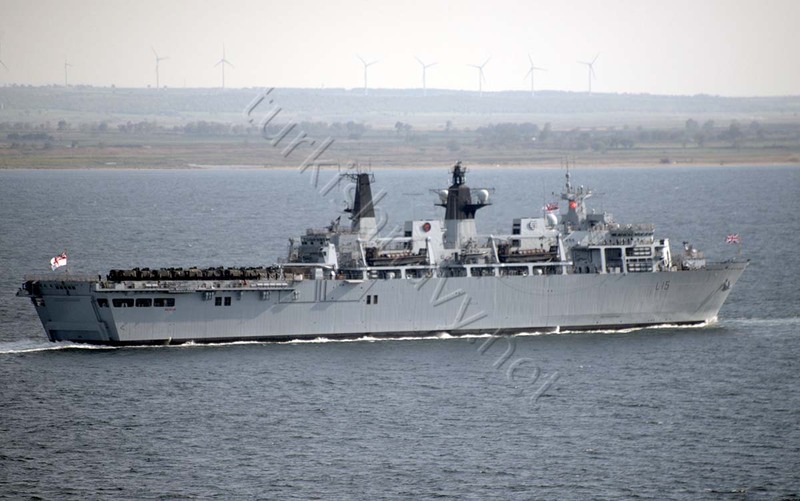 This is almost the double of her indicated top speed of 30 knots. 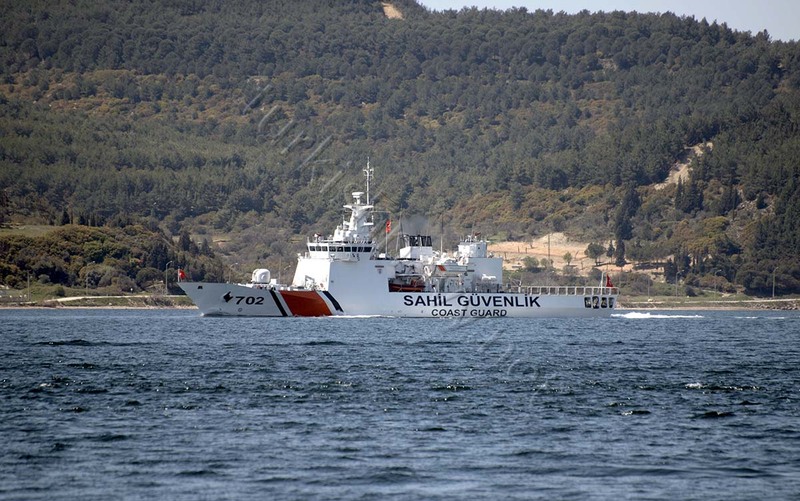 So here we have either a real flying Frenchman (her high-speed must have made her observance from the shores impossible as she passed through the Turkish Straits) or the AIS transponder is not correctly configured. Her real whereabouts is still a mystery to me. 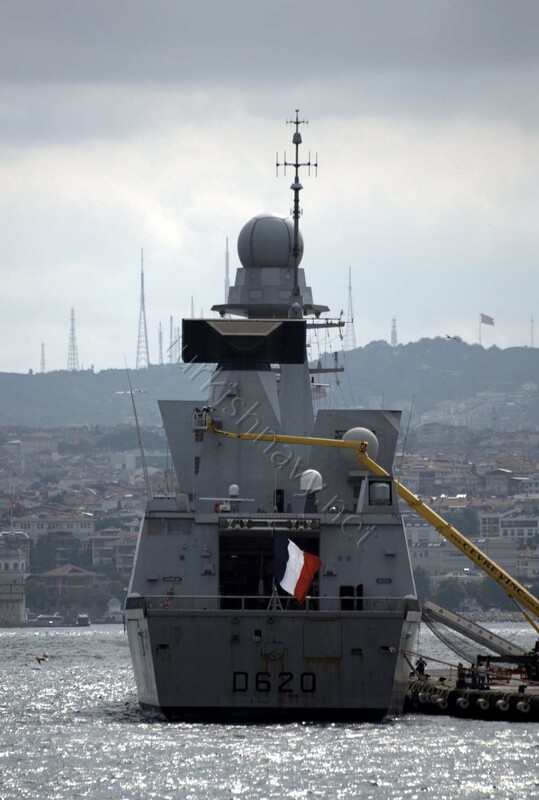 FS Forbin moored in Istanbul. 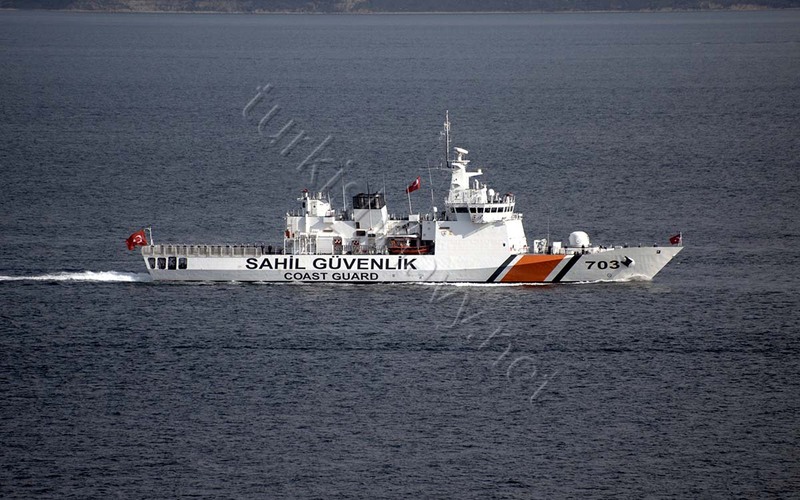 Photo: Serhat Güvenç. Used with permission. We are having a distinguished guest since 7 July 2015. 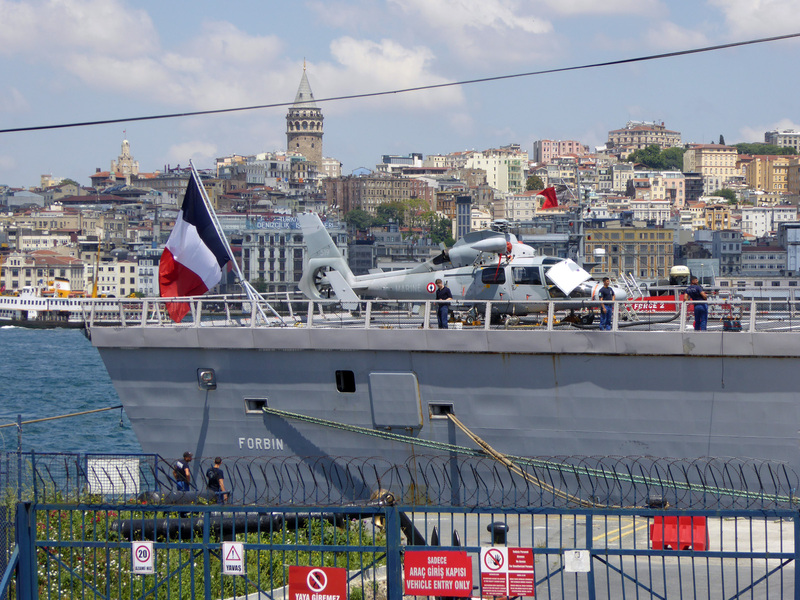 The French Horizon class destroyer D-620 FS Forbin is in Istanbul. 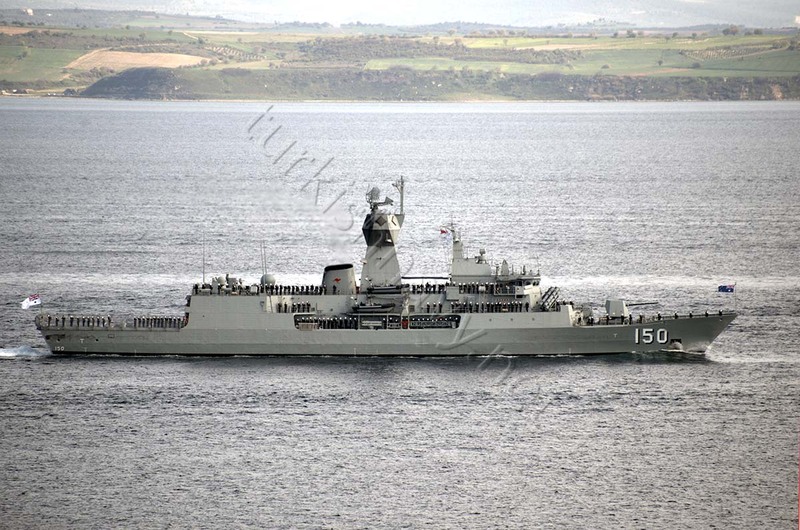 Although she is classified as anti-air frigate she is to be considered as a destroyer. 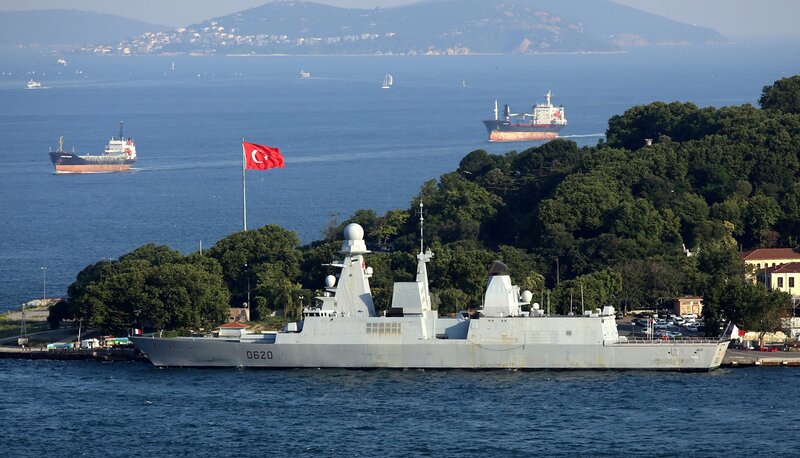 The visit of FS Forbin is the first visit of a Horizon class warship in Istanbul ever. 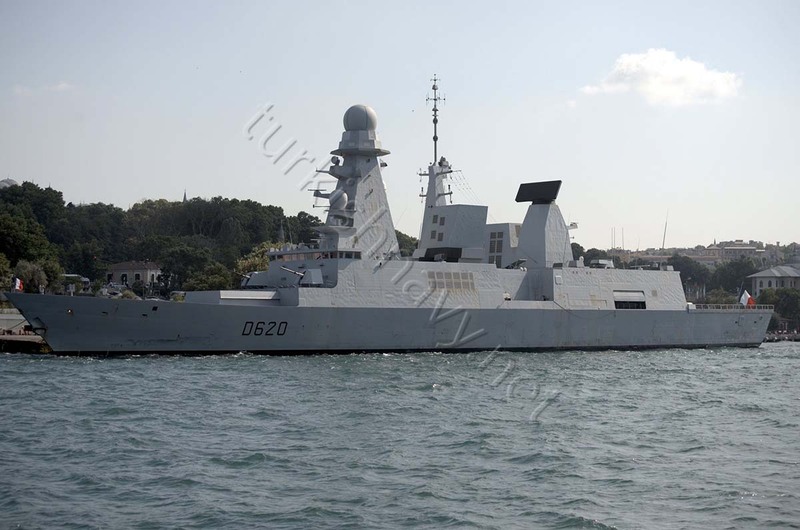 Her sister D-621 FS Chevalier Paul was in Marmaris two years ago. 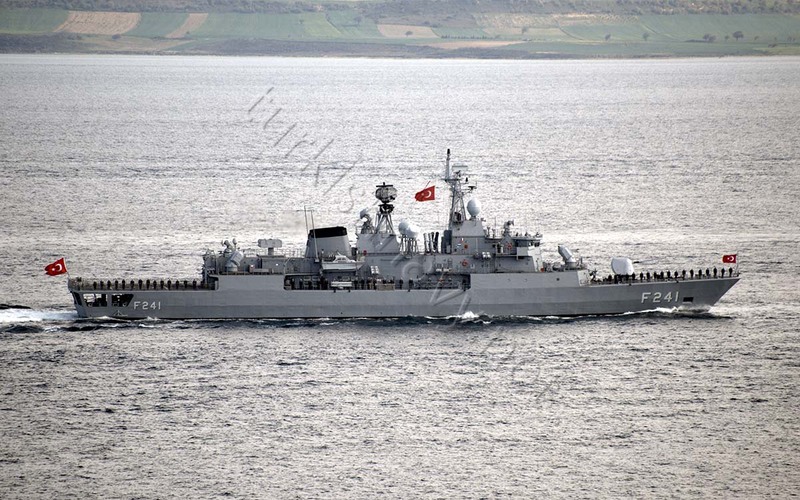 The visit of FS Forbin is not a routing port visit just to show the flag and establish good relationships. The ship needed resupply and maintenance. The supply chain of FS Forbin. Photo: Alper Böler. Used with permission. Working on the aft SPN 735 surface radar. 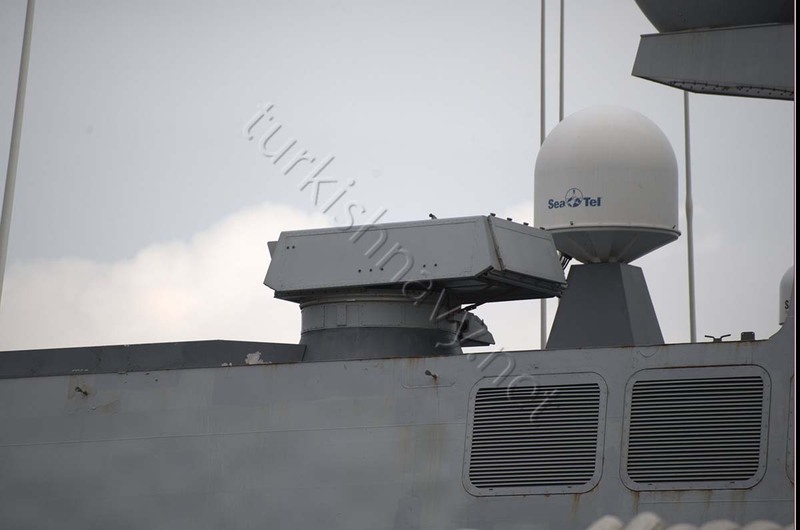 The radar is not accessible from inside the ship. Two sailors are working on the radar while the crane operator is clearly bored. 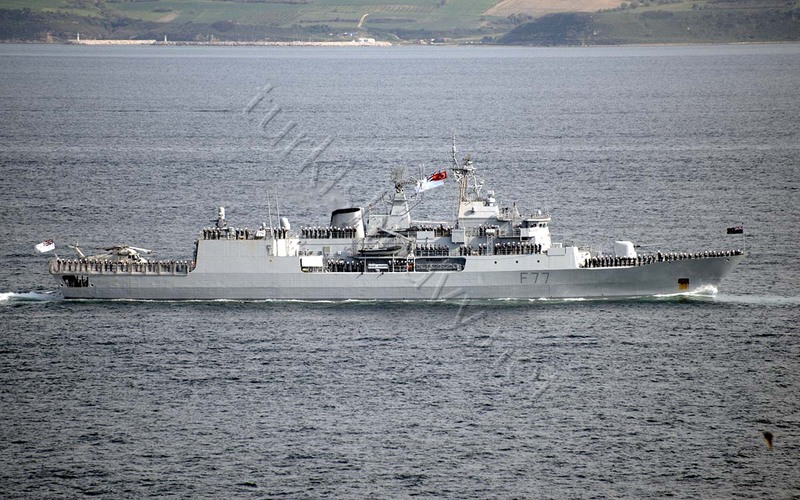 The Horizon class ships have two navigation and surface surveillance radars. 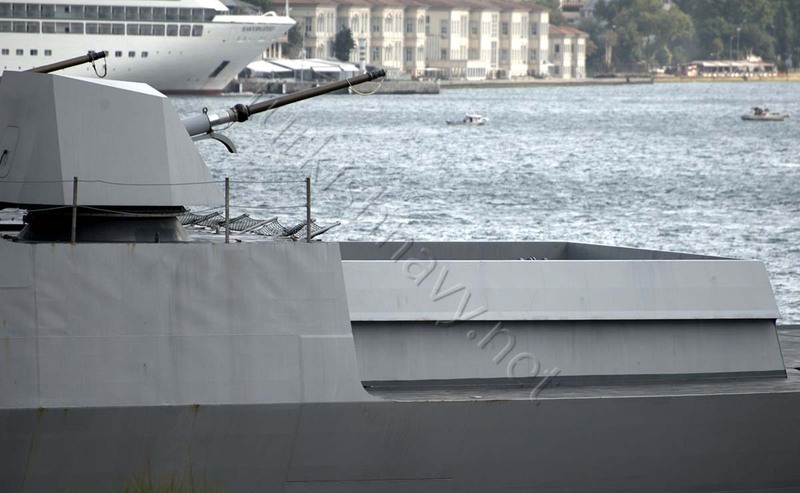 The forward one is atop of the bridge and the aft one is on the mast that supports the SMART-L radar. 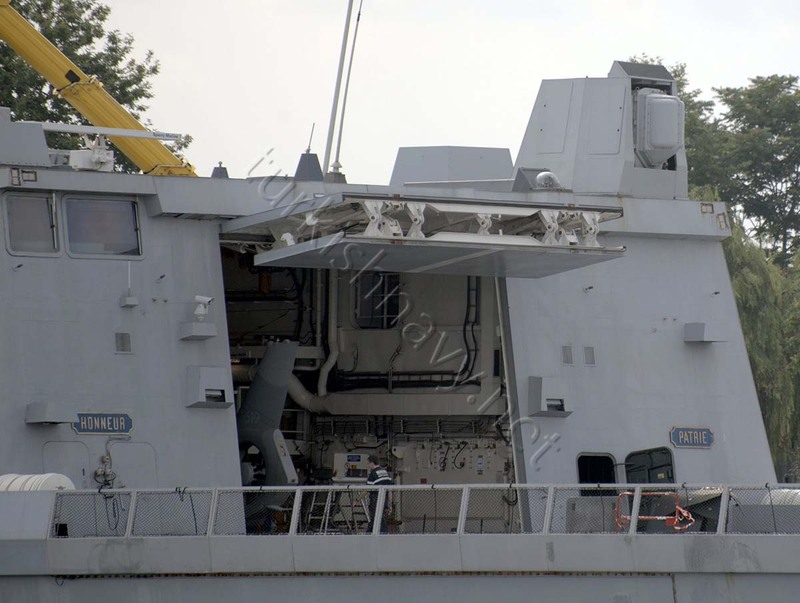 It is not possible for the crew to access the aft radar from inside the ship. 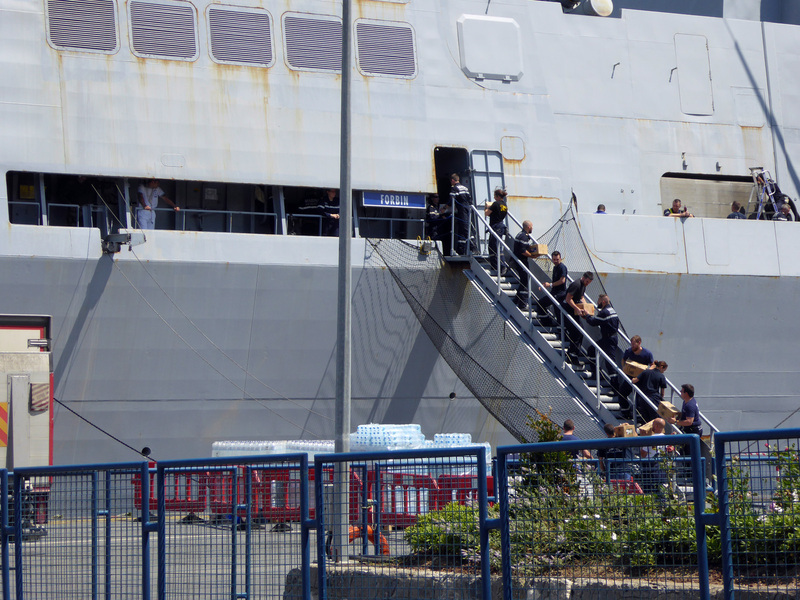 There are no hatches or stairs. 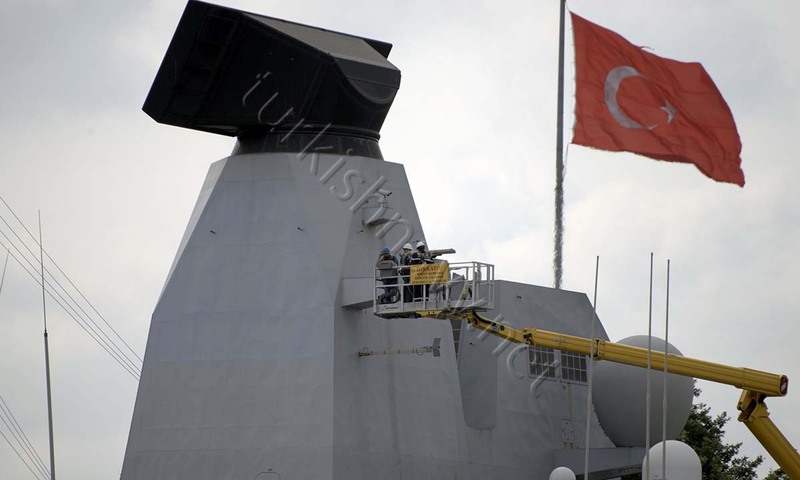 Thus a crane was hired in Istanbul to allow two sailors to perform maintenance or repair work on the aft MM/SPN-753 navigation and surface surveillance radar. So this means there is no way to repair this radar underway. I find the decision to place that radar to an inaccessible place very strange. The on board helicopter is an AS-565 Panther with tail number 519. Photo: Alper Böler. Used with permission. Photo: Alper Böler. Used with permission. The hangar of the ship looks very spacious. 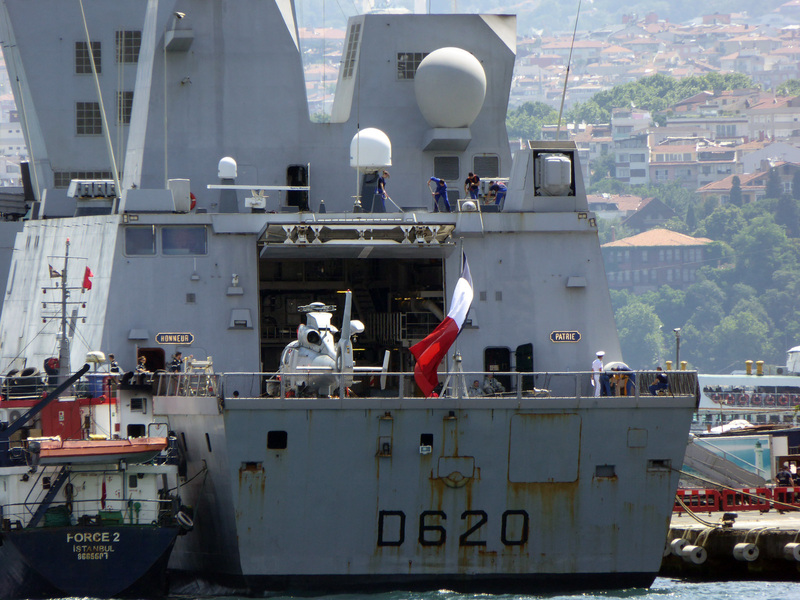 The ship accommodate larger helicopters such as NH90, than the currently on board AS-535 Panther. 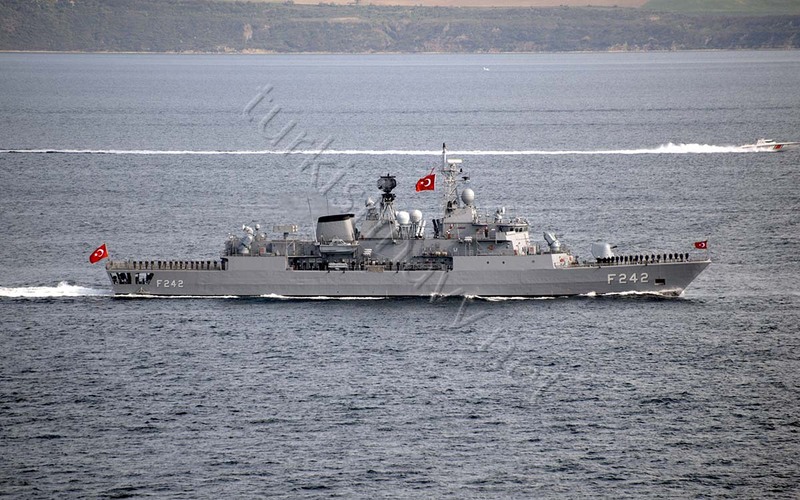 Interestingly the funnels and the masts of the Horizon class are not symmetrical. Sagem NGDS multi function decoy launcher. Photo: Alper Böler. Used with permission. 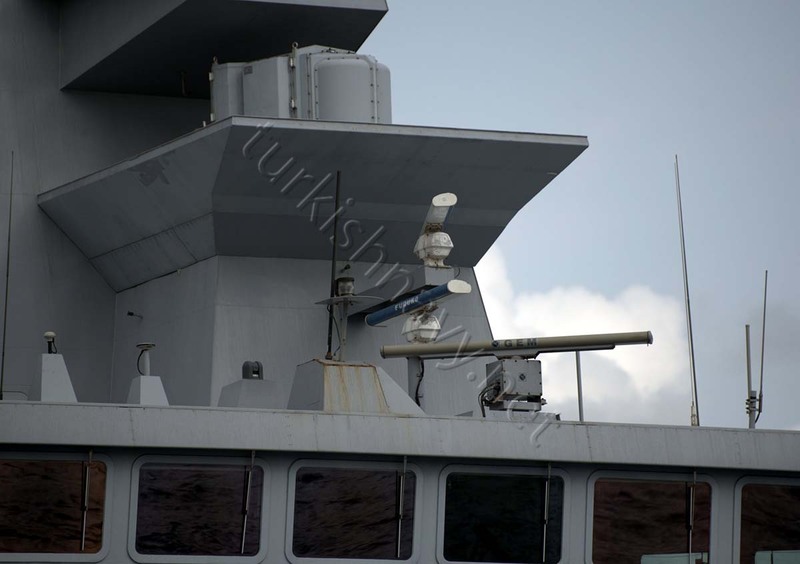 Below are more photos of important sensors and weapons of the ship. 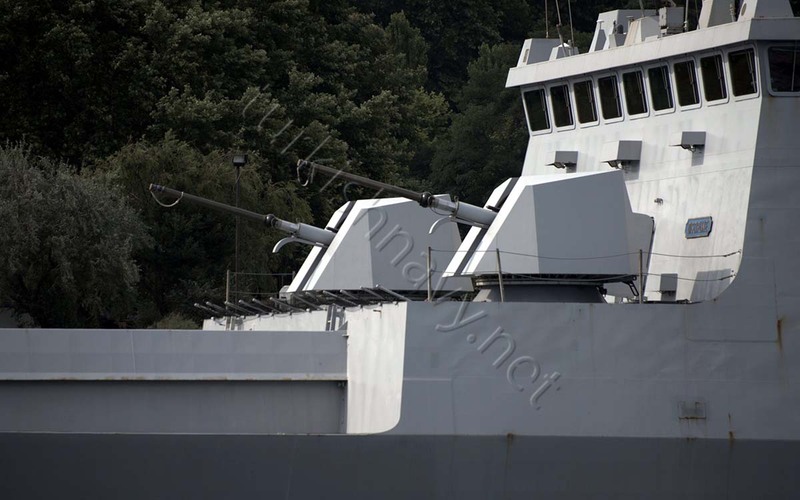 2 Oto Melara 76mm Super Rapid guns. The side by side configuration is not usual. 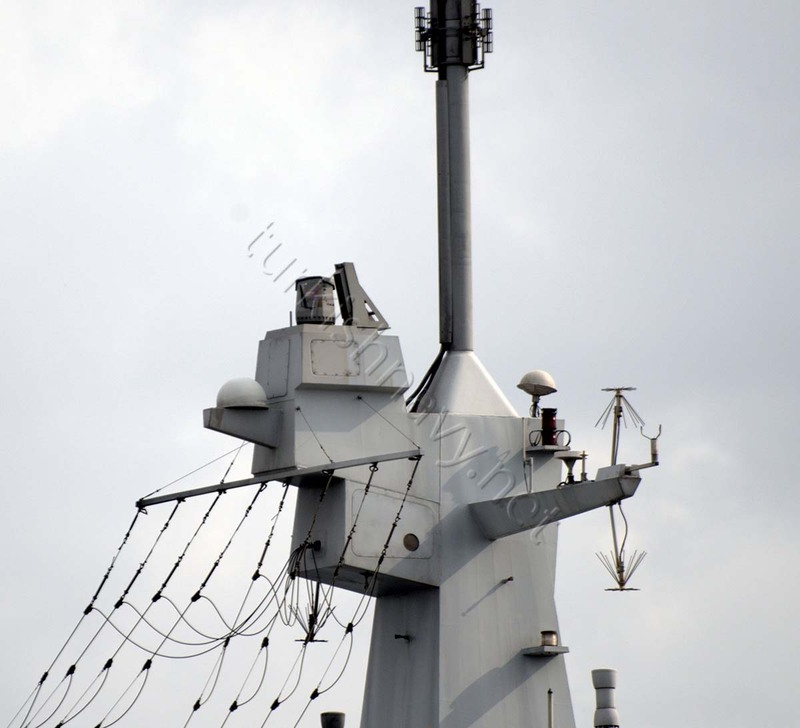 A top of the middle mast is the Sagem EOMS NG optronic system. It rotates approximately 60 times a minute. 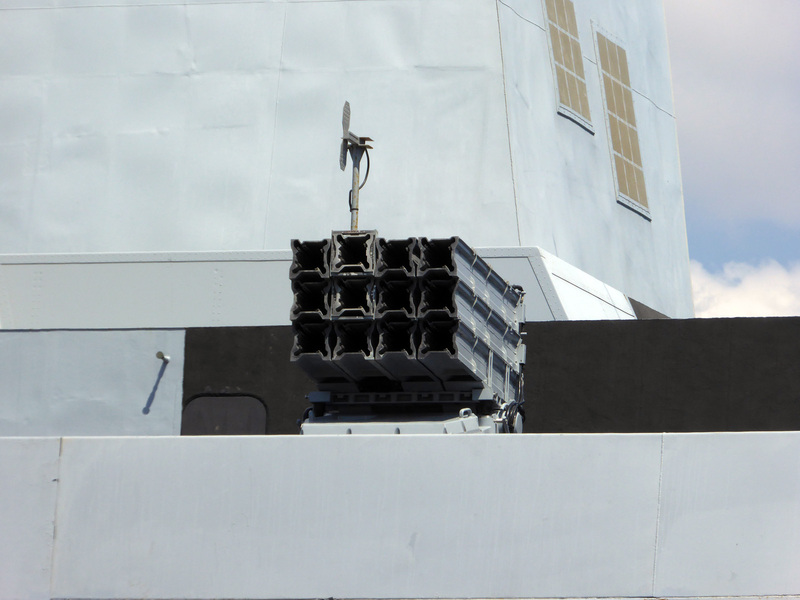 DCNS Contralto-V anti-torpedo decoy launchers. 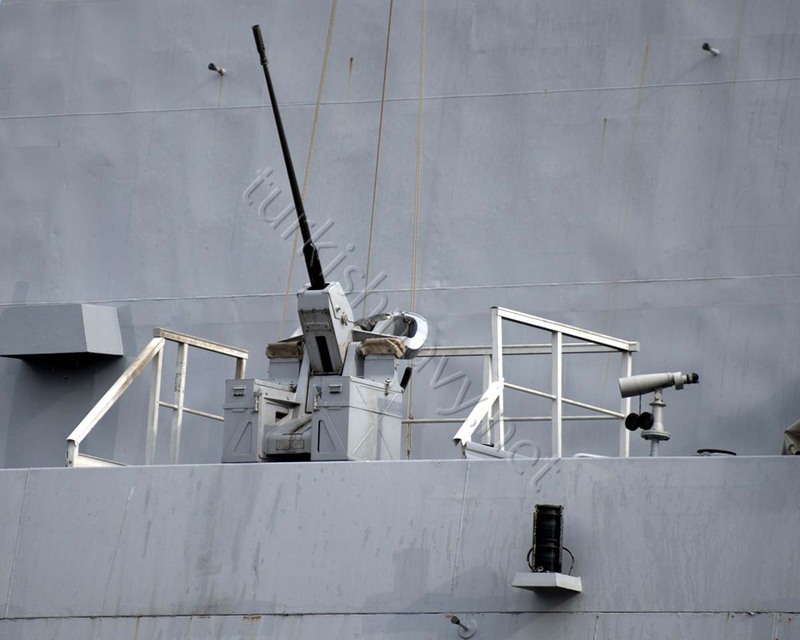 Alenia Marconi NA 25 XP fire control system for the OTO Melera guns. The front mast. 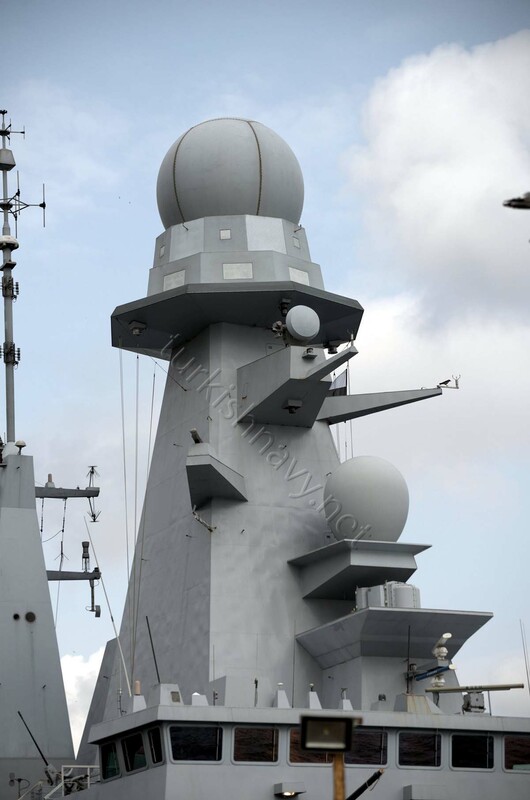 From top to down: Alenia Marconi SPY-790 EMPAR surveillance and fire control radar, sensors for ESM system, Alenia Marconi NA 25 XP fire control system, Thales C&S Surfsat-L SATCOM antenna for Syracuse satellite service, jammer of SIGEN EW Suite, 2 FURNO navigation radars and the fore SPN 735 surface search radar. 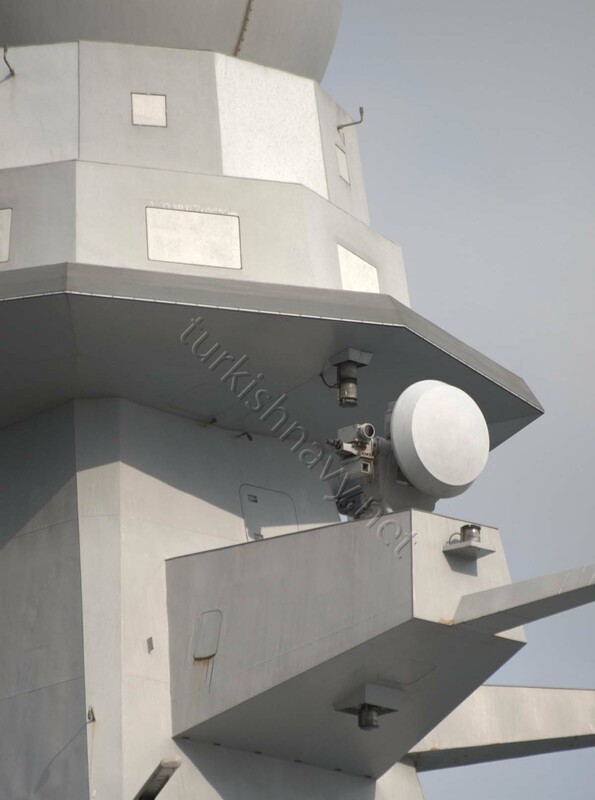 Atop of the bridge: Jammer of SIGEN EW Suite, 2 FURNO navigation radars and MM/SPN-753 navigation and surface surveillance radar plus a number of unidentified sensors. 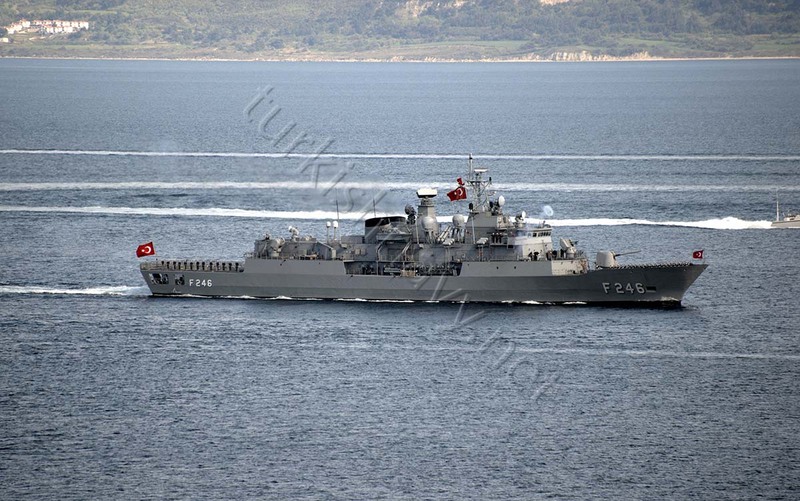 Sylver A-50 VLS launcher for Aster 15 and Aster 30 missiles seems to be well protected from the sea. 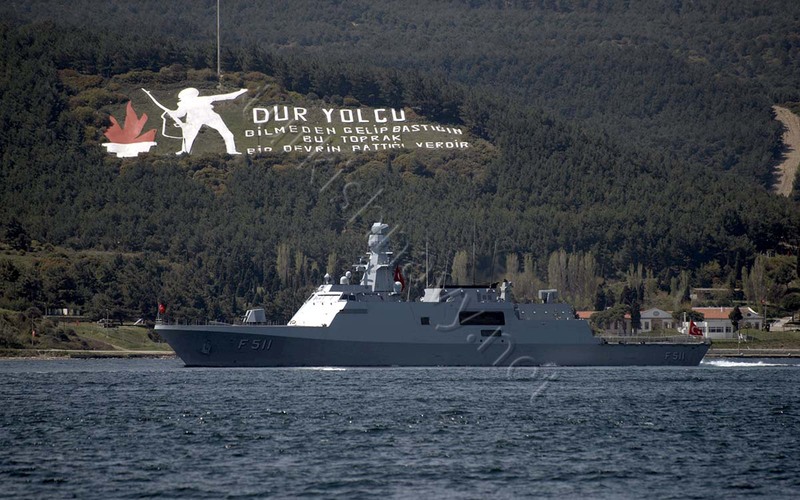 On 24 April 2015, to commemorate the 100th Anniversary of Çanakkale Wars, a naval parade was held under the command of Turkish Navy Northern Task Group Commander Rear Admiral Ali Murat Dede. 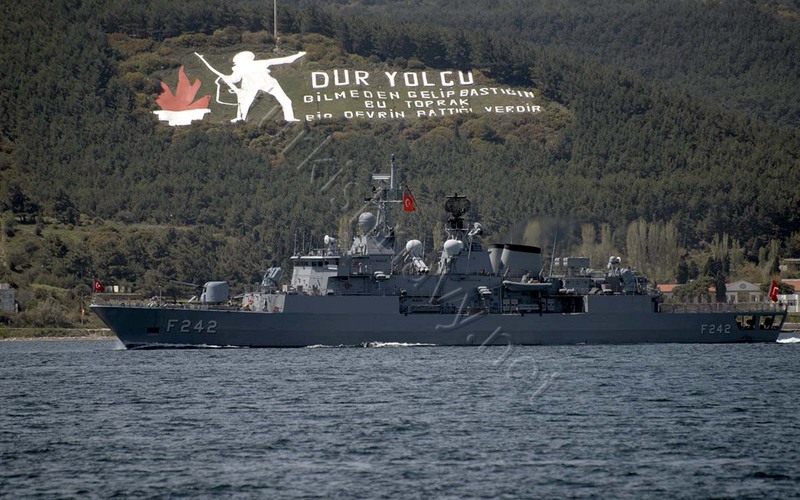 To commemorate the 100th anniversary of Gallipoli Land Wars, 4 different ceremonies were held. 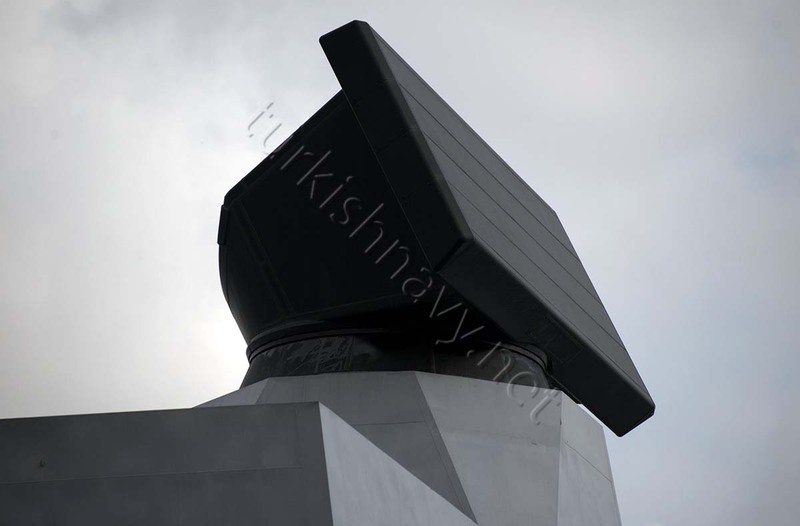 The first ceremony was organised by Turkish Republic at the Turkish War Memorial on 24 April 2015. On the same day following these Turkish ceremony one ceremony at the British War Cemetery and one in French Cemetery are held simultaneously by their respective nations. 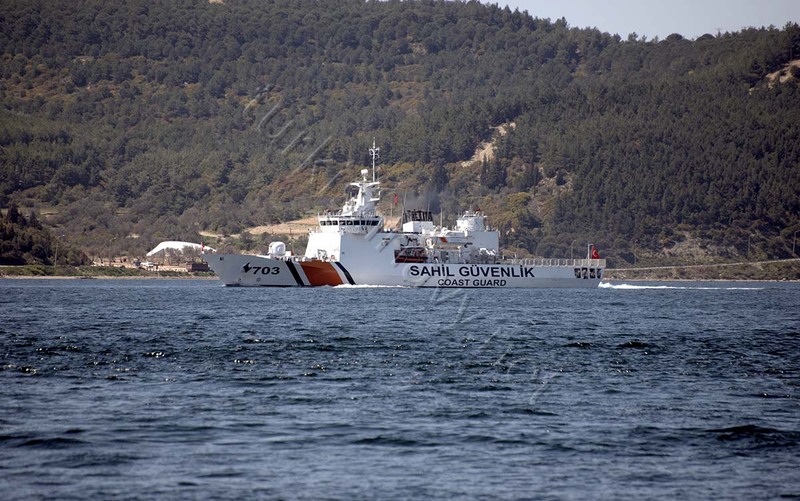 The last and, one of the major commemoration ceremonies was the Dawn Service at the Anzac Cove on 25 April 2015. More than ten thousand Australians and New Zealanders attended this special event. 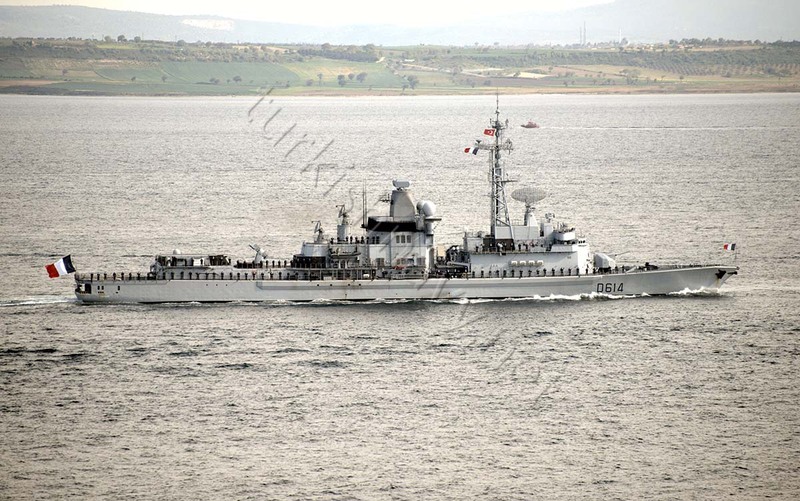 The naval parade was organized for the commemorations at Turkish War Memorial and for the Anzac Dawn Service. The following photos are from the first event. The parade of the warships was followed by an impressive show of Turkish Stars the aerobatic demonstration team of the Turkish Air Force. Click here for the photos. For the photos of the rehearsal click here. 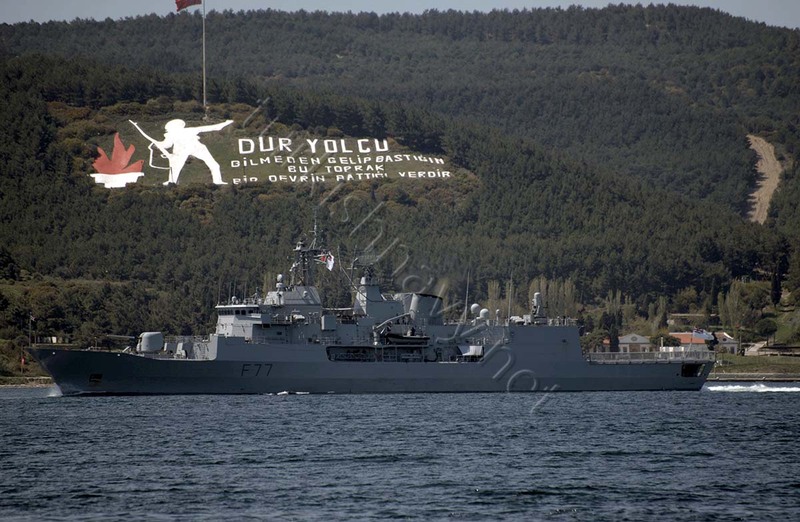 On 23 April 2015, 11 warships from 5 different nations gathered in Çanakkale to commemorate the 100th Anniversary of Çanakkale Wars. 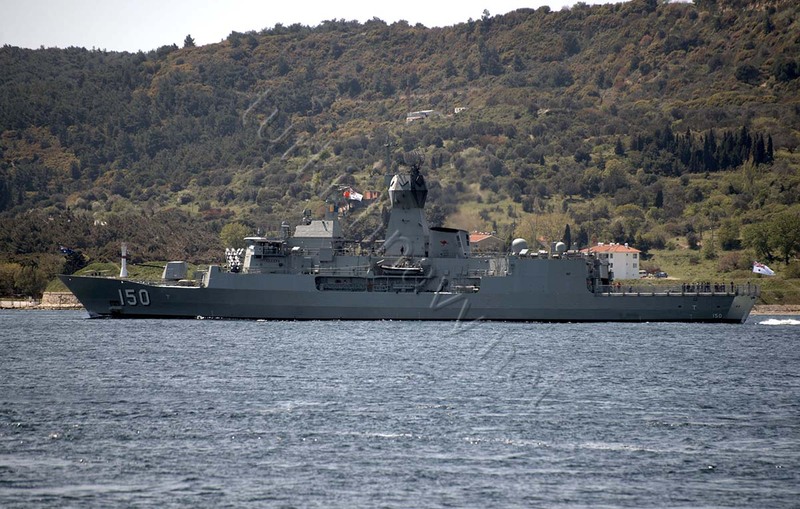 Two of them F-77 HMNZS Te Kaha and 150 HMAS Anzac arrived after a very long journey. 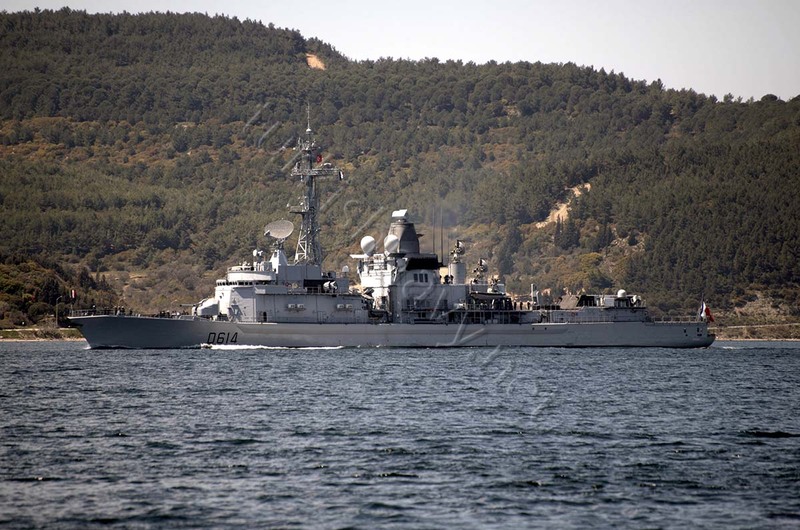 The New Zealand frigate Te Kaha left her home port in 16 February and The Australian Frigate Anzac on 15 March 2015. 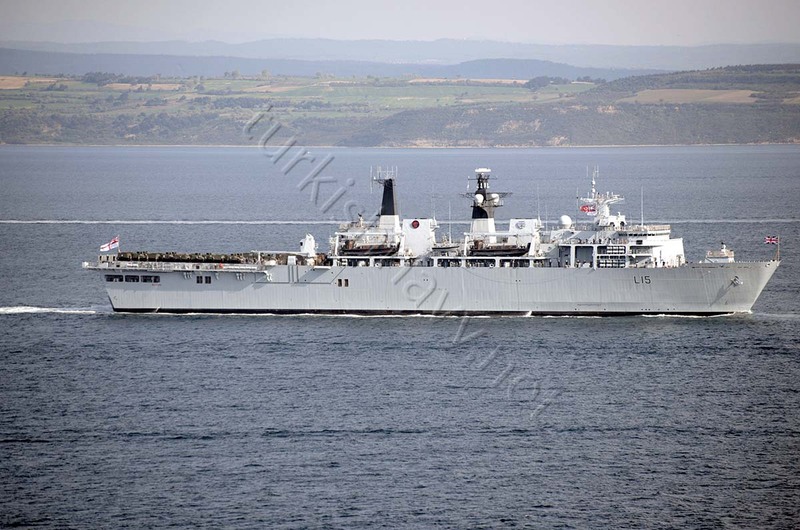 In addition to Australian and New Zealand frigates the British assault ship HMS Bulwark and the french destroyer FS Cassard ware also present. 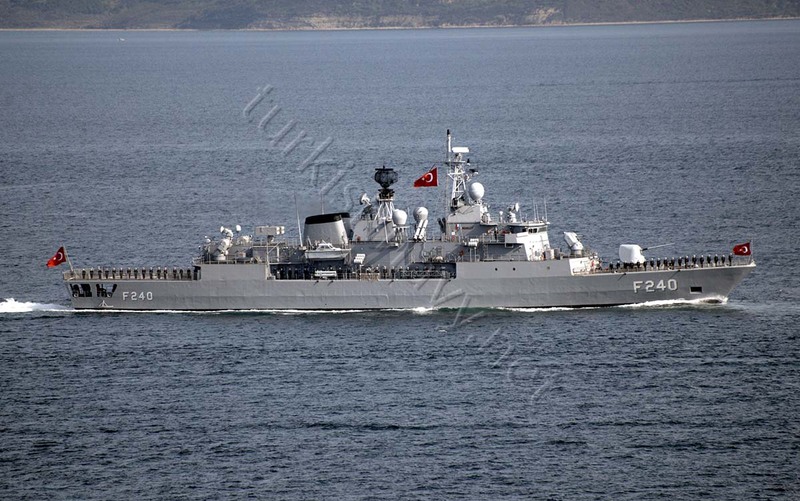 From Turkish Navy TCG Salihreis, TCG Yavuz, TCG Turgutreis, TCG Fatih TCG Heybeliada took part in the commemorations. 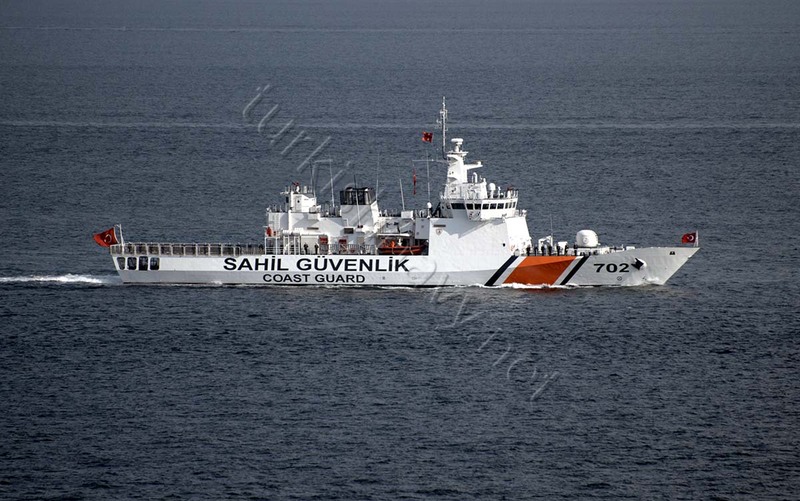 And Turkish Coast Guard participated with the offshore patrol vessels TCSG Güven and TCSG Umut. 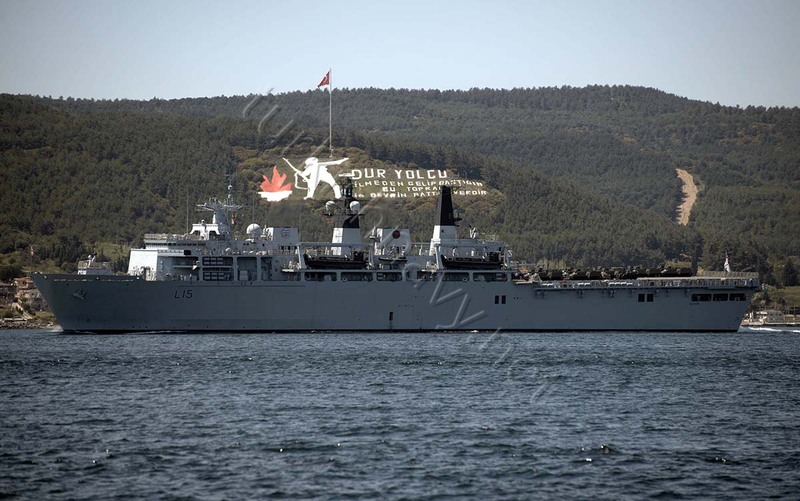 The above photos are taken on 23 April 2015 as the ship sailed southbound on Dardanelles for a rehearsal. 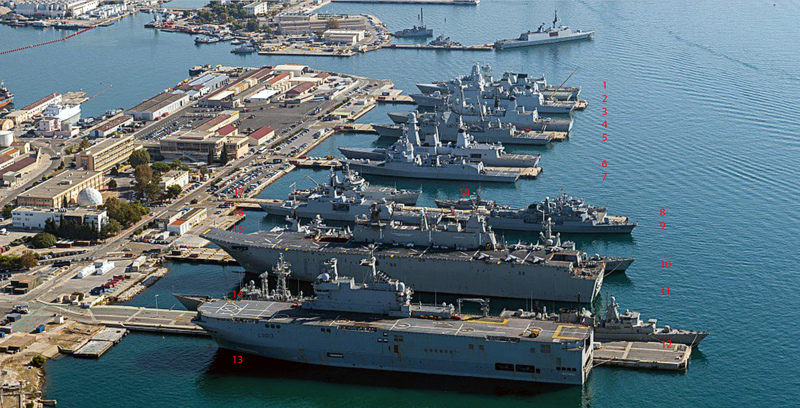 For the photos from the international sail past click here. 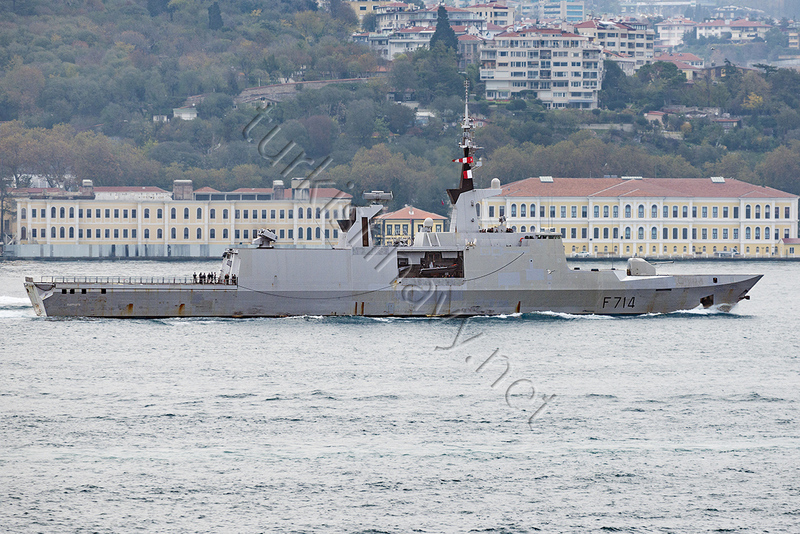 The French La Fayette class frigate F-711 FS Surcouf making southbound passage through Bosphorus on 17 June 2014. 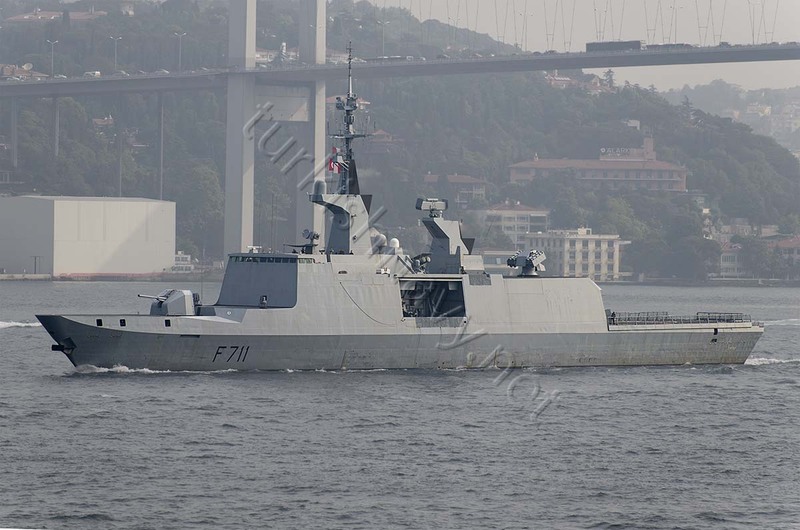 FS La Fayette has the same appearance. 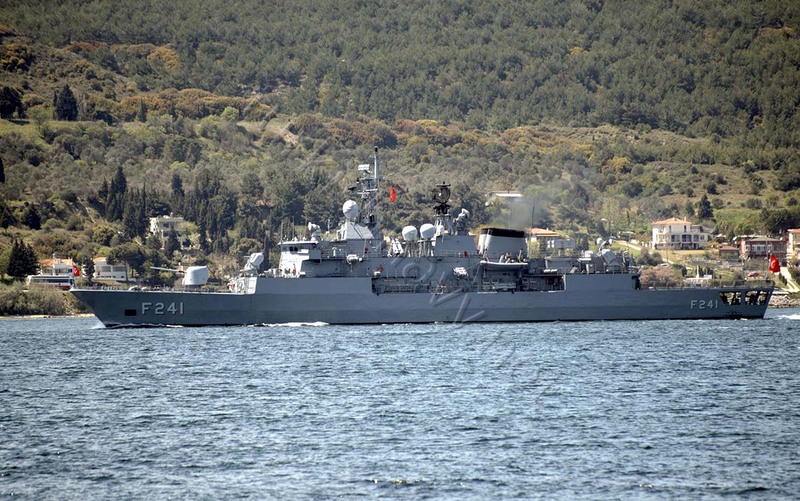 The French frigate, F-710 FS La Fayette arrived in Aksaz Naval Base in Marmaris for a port visit. The duration of the visit was not disclosed but I assume it would be at least a 3 day visit. 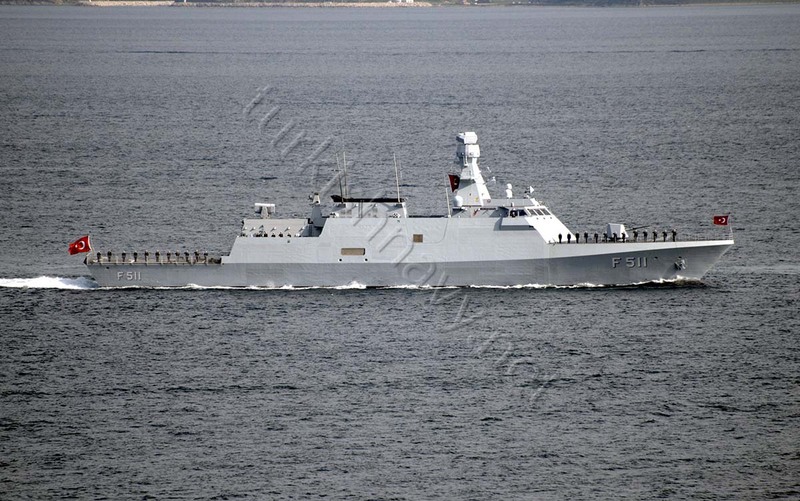 The ship, first of its class, is a multi-mission stealth frigate. 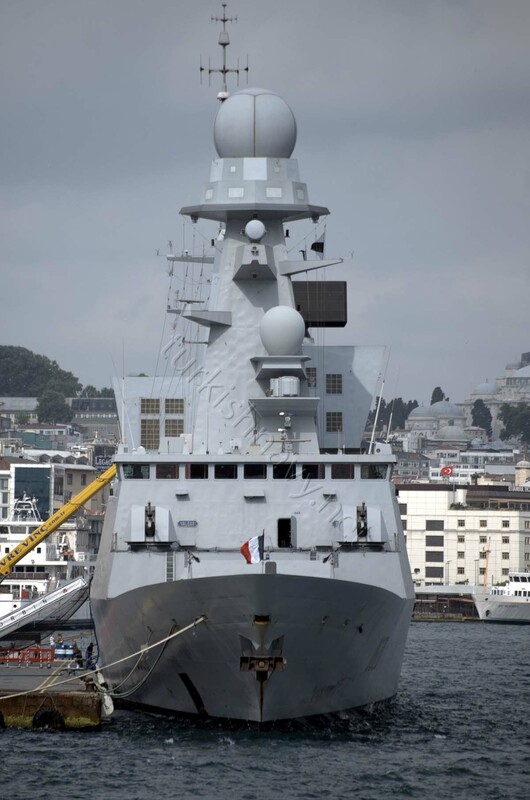 Her design inspired many warships designed after her. 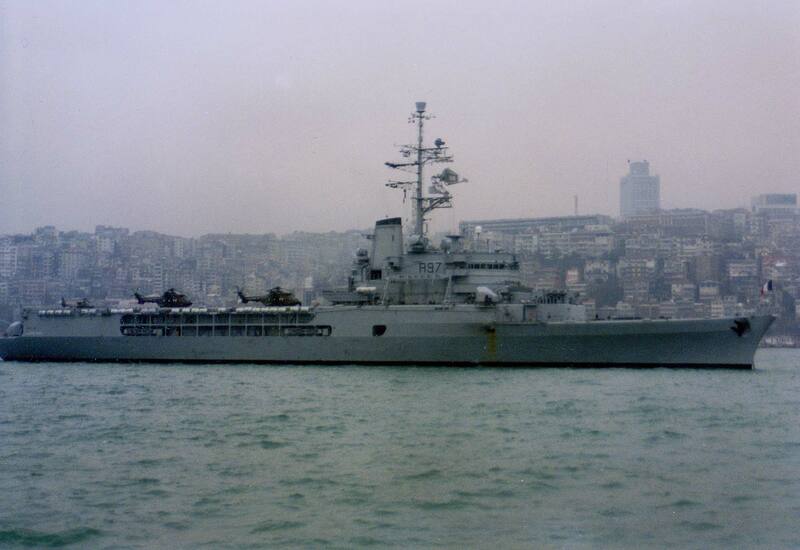 To celebrate the Bastille Day, I am posting the photo of the French T-53 class destroyer D-633 FS Duperre. This photo was taken in 1989. 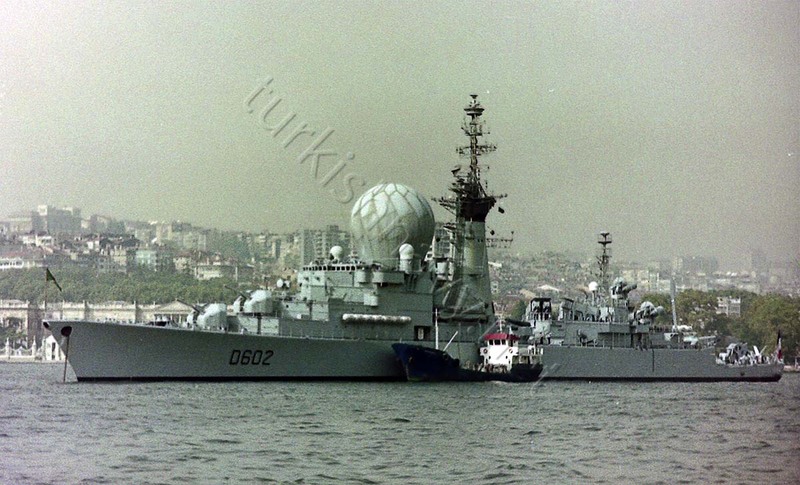 This is French frigate D-603 Suffren with her unique DRBI23 3D radar radome on top of her pilot house. 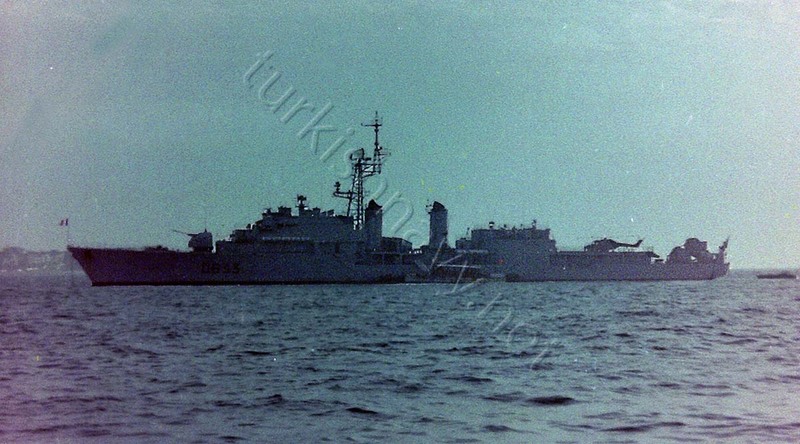 This photo was taken in October 1991.